OPPO’s R series of smartphones, which caters to the premium segment, gets refreshed quite quickly. The R15 went official in March last year and was soon followed by R17 in August. Now, a teaser for the next model in the series – the OPPO R19 – has leaked online. The teaser reveals the design of the upcoming OPPO R19 smartphone, along with a key feature that will create some excitement for the upcoming handset. Going by the teaser, it’s clear that OPPO is going with the pop-up camera setup in the R19. Since there is no visible front camera, we can safely assume this will be OPPO’s first phone with the Vivo NEX-like pop-up selfie shooter; incidentally, the same feature is coming to the Vivo V15 Pro in India too. The other feature confirmed by the teaser is a rear 48-megapixel shooter; however, it remains to be seen whether it will be Samsung’s GM1 sensor or Sony’s IMX sensor. Also, the teaser is showing a dual camera setup on the phone pictured above which makes us think that this could be a regular OPPO R19. The R19 Pro could feature a triple camera similar to the OPPO R17 Pro (review). The poster is uncannily similar to the OPPO F11 Pro leaked teaser we brought to you exclusively last week. The only difference is the absence of the rear fingerprint reader on the R19 poster. Hence, judgements are to be reserved until we see something from an official OPPO account. 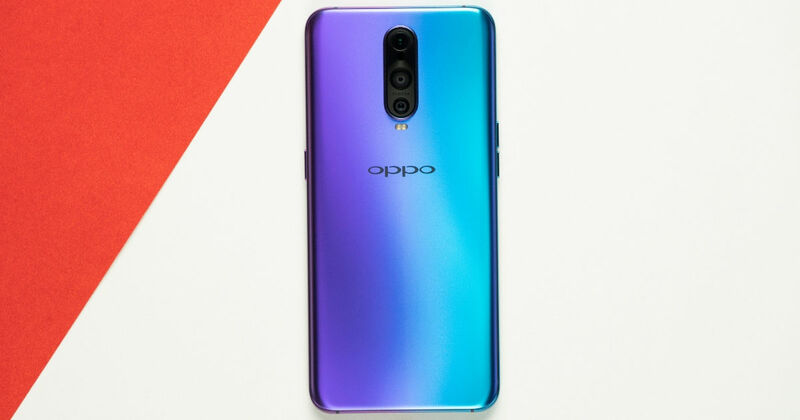 Previous leaks have hinted that both the OPPO R19 and the OPPO F11 will rock a pop-up camera, a rear fingerprint reader and ColorOS 6.0 based on Android Pie.